The Apostle John identified himself in 3 John only as “the elder” (3 John 1:1), the same as he did in 2 John. At the writing of this, his final epistle, John was nearing the end of his life, a life that had changed dramatically some six decades before, when Jesus had called John and his brother James out from their fishing boat. The boys had left their livelihood and their father Zebedee to follow Jesus (Matthew 4:21-22). While James was the first of the Twelve Disciples to die for his faith, John outlived all the others. John referred to himself in his gospel as “the disciple whom Jesus loved” (John 21:20), a title that highlights one of the great themes of all John's biblical contributions, including 3 John—the love of God working itself out in the lives of human beings. While Gaius was dealing with certain troubles in his area, John wanted to direct him, not only in how to respond to the trials but also how to relate to those who proclaim the truth. John's three epistles are largely concerned with the issue of fellowship—with God, with enemies of the gospel and, in the case of 3 John, with those who proclaim the truth. John wanted to ensure a warm welcome from the churches to those who travelled around preaching the gospel, offering them hospitality and a send-off “in a manner worthy of God” (3 John 1:6). Troubles had come to the church in Asia. Diotrephes had taken control of one of the churches there and used his power to ban certain travelling missionaries from coming to the church at all. At one point, the church had seen something of a leadership quality in him and had placed him in charge, but now in the top spot, the power had gone to his head. He refused to welcome those travelling ministers of the gospel to preach and take rest with his church. And even worse, upon receiving an earlier correction from John, Diotrephes refused to listen (3 John 1:9). This troubling situation prompted John to write to Gaius, commending the believers for holding fast to the truth and doing so with a loving attitude. These Christians strove to make the gospel a reality in their lives through the way they treated one another. And John, in response to this good report about the behaviour of these “rank and file” Christians, encouraged them to continue to love and support those visiting believers who gave of themselves and ministered in the churches of Asia. John used words such as love and truth to describe this kind of living, and he used the negative example of Diotrephes to illustrate the dangers of going down a different path. We have a responsibility as Christians to live according to the truth we find in the life and ministry of Jesus, to care for and support those who serve God's people. Our Lord was surrounded by people who took care of Him. Third John teaches us that we should do the same for those who carry on the teaching of Jesus in our own day. 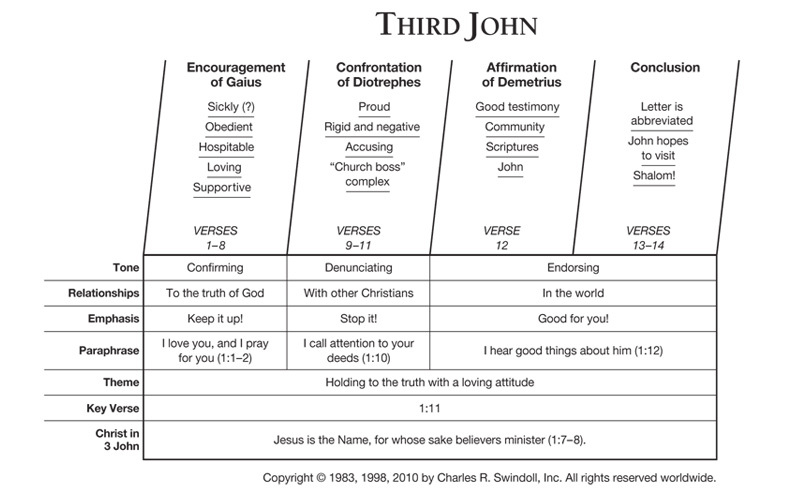 Find resources in the book of Third John in our resource library.